A Fine North European Silver-Hilted Small Sword mid 18th c.
Of diminutive size, with slender hollow-triangular blade with gold inlaid scrollwork at the forte. 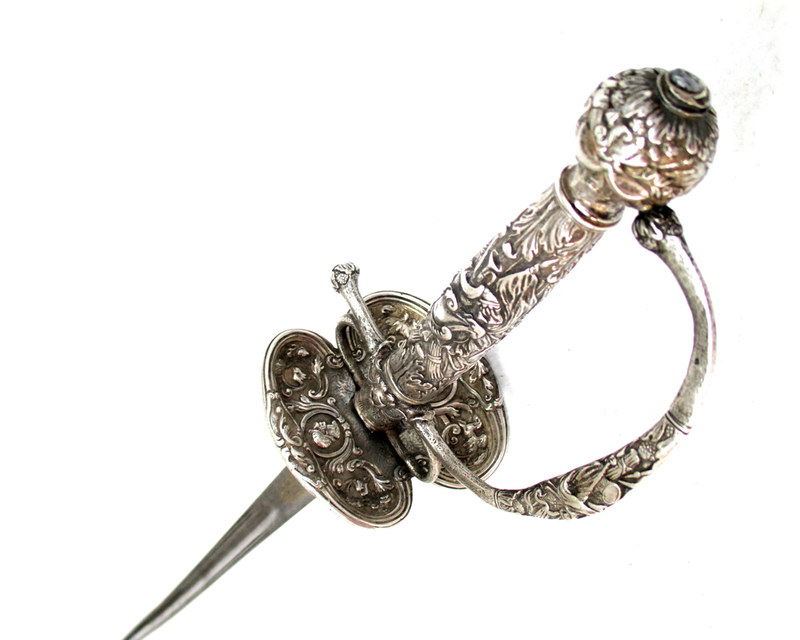 Silver hilt comprising double shell-guard with molded edge, single quillon, a pair of arms, knuckle-guard, ovoid pommel and silver grip, all cast and chased with martial trophies and bordered by acanthus leaves on the grip and knuckle -guard, the shell-guard with portrait heads and winged beasts on a finely punched ground. Struck with an unidentified mark. Length O.A. 36" Blade 30 1/2"
Condition: The blade with a small area of pitting at the forte, the silver is quite crisp and fresh.